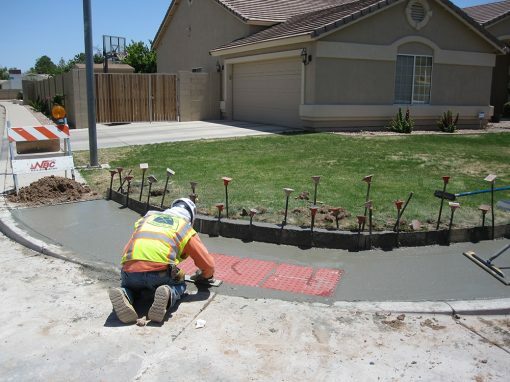 City of Scottsdale Concrete Repair Services - Valente Contracting, Inc. This project includes Citywide concrete repairs for right of ways on an as-needed basis including updating ramps to be ADA compliant and repairing water ops. MJVC is working closely with the City to complete this project on a tight schedule. Work completed to date includes removal and retrofit of 73,246 SF of ADA sidewalk ramps, remove/replace 15,402 SF of sidewalk, remove/replace 17,913 LF of curb and gutter, sawcut, remove/replace 3,121 SF of asphalt, and install 5,284 SF of truncated dome tiles.